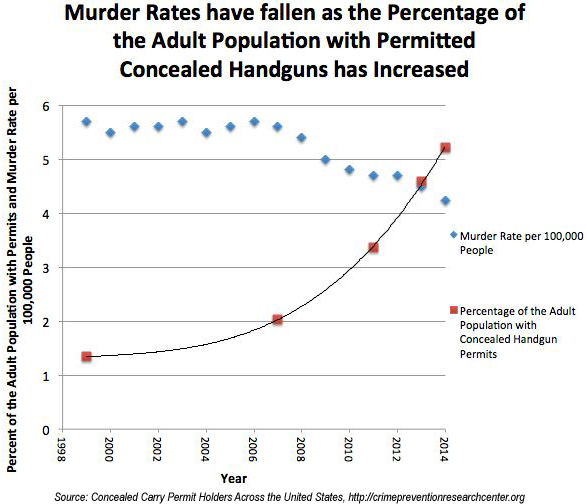 A new study by the Crime Prevention Research Center (CPRC) finds that the number of people with concealed firearm carry permits has reached an all-time high, and that increasing the number of permit-holders is associated with a decrease in murder and total violent crime. The study notes that the number of carry permit-holders has increased most sharply during the Obama administration, from 4.6 million in 2007 to over 12.8 million currently. Furthermore, coinciding with Pew Research Center polling finding that support for gun ownership and opposition to gun control is increasing among young people, minorities and women, the CPRC study found that carry permits are increasing more among minorities than among whites, and more among women than among men. Both sets of findings contradict gun control supporters’ claim that gun ownership is confined to elderly white males. Gun control supporters continue to pretend that permit-holders commit crimes at a high rate, but the CPRC study concludes that permit-holders are “extremely law-abiding,” convicted of crimes at a lower rate than even law enforcement officers in some states.This represents a 25% drop in the murder rate at the same time that the percentage of the adult population with permits soared by 156%. Overall, the study notes, between 2007 and 2014, as permit numbers have increased, “murder rates have fallen from 5.6 to 4.2 (preliminary estimates) per 100,000. This represents a 25% drop in the murder rate at the same time that the percentage of the adult population with permits soared by 156%. Overall violent crime also fell by 25 percent over that period of time.” In sum, the CPRC study validates what supporters of modern firearm carry laws have been saying ever since past NRA President Marion P. Hammer got the Right-to-Carry ball rolling with Florida’s adoption of a “shall-issue” carry permit law in 1987. Detractors in Florida and in states that adopted similar laws thereafter uniformly predicted dire consequences if people were allowed to carry firearms for protection, but those predictions have not come to pass. Americans who carry guns for protection have earned the trust of their countrymen, and that trust has become the foundation upon which further legal recognition of defensive firearm rights will continue to be achieved.